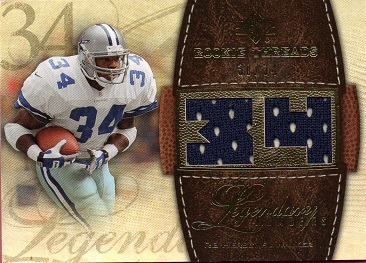 I just picked up another insert card in the 2008 SP-Rookie Threads set. There are 5 different cards in the set, all serial numbered in different amounts. I have 4 of the 5. 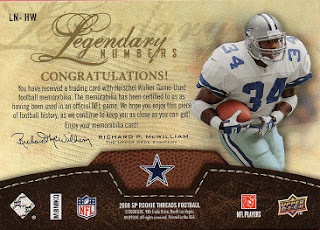 The last one will be tough to acquire, as it's a 1-1, with a total of 15 players in the set. In this, the Legendary Numbers-Jersey Numbers set, each card displays a swatch from a game used jersey, which forms the player's uniform numbers. This example, showing Herschel's famous #34 is card number 30 out of 34.